No! Not this guy! Yes. This guy. 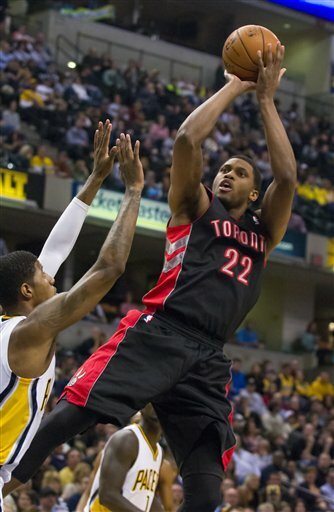 This is why Bryan Colangelo traded for Rudy Gay...to close out games. Rudy Gay nailed the game-winner over Paul George with 1.7 seconds to play in overtime to grind out another win against the Pacers at Conseco Fieldhouse. Gay had a bit of a rough shooting tonight going into the fourth quarter, but got it together when it counted most, scoring 17 of his 23 points in the final quarter and overtime period. This was looking to be one of those matchups where the Raptors collapse in the fourth quarter. But Toronto caught a break at the end of the fourth quarter where Rudy Gay stole an inbounds pass from David West in the closing seconds and was able to get it to Amir Johnson for the game-tying buzzer beater to send the game to overtime. Amir Johnson has been nothing but stellar since the departure of Ed Davis...had Amir not fouled out in the overtime period, Johnson would have likely a bigger factor in this win. Welcome back, Jonas. After sitting out 20 games with the hand injury, this was definitely his best game since the return. Valanciunas put in a solid 26 minutes for the Raptors, finishing with a double double (14 pts, 13 reb) which included some extra run in overtime after Amir Johnson fouled out. Jonas left the game temporarily after 'Psycho T' Tyler Hansborough pushed Valanciunas to the floor (and surprise, there was a no-call.) I'd expect Valanciunas' solid performance tonight to warrant more minutes from Coach Casey. Solid game from the 18-foot assassin for the Pacers, scoring a game-high 30 points. West schooled the Raptors' Valanciunas in the overtime period as Jonas was forced to a defensive mismatch against West after Amir Johnson fouled out. It was a great perfromance for West but his biggest mistake of the game came when he turned the ball over at the end of the fourth quarter, which led to the Amir Johnson basket to send the game into overtime.